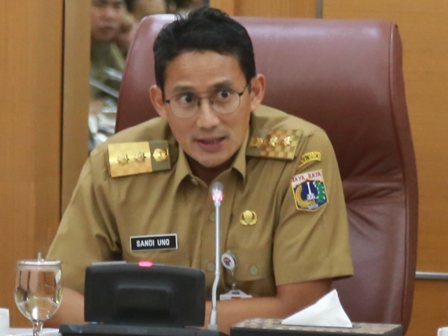 Around 380 street vendors (PKL) who used to peddle their wares in Kota Tua area, West Jakarta, met Jakarta Deputy Governor, Sandiaga Uno at City Hall, Jalan Medan Merdeka Selatan, Gambir, Central Jakarta.
" We'll discuss it further to help them to get high income"
During the meeting, those who open stall along Jalan Kunir, Jalan Bank, Jalan Asemka and Jalan Jembatan Batu were complaining their low earnings in recent times. Jakarta Deputy Governor, Sandiaga Uni promised to find the best solution in which the time of sales will be forwarded up to 5 PM. "We'll discuss it further to help them to get high income," he stated, Monday (11/20). Aside that, those PKL also made a proposal about the use of an ex-land Jiwasraya on Jalan Lada. Hence, Sandi intends to immediately meet with the consortium side soon. "This is because they (PKL) heard that there was a plan for the night market there. So they request to be facilitated or accommodated on the land," he closed.